When Alexander left Egypt to conquer the rest of the known world, he left the Persian infrastructure in place and appointed as the satrap one Cleomenes, a banker of Naucratis. This post was next taken over by Ptolemy I, the son of Lagus - Alexander's boyhood friend at Pella who later became one of his trusted generals. 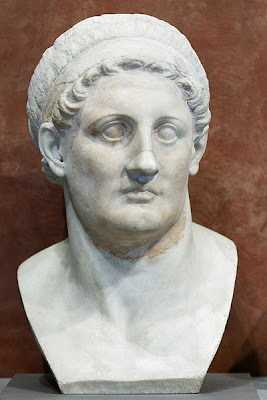 When Alexander died in 323, Ptolemy acted, nominally at least, as satrap for Alexander's two successors in Egypt. Cleomenes, in Alexander's name, had extorted money from the people, robbed temples and, worse, embezzled the soldiers' pay. Ptolemy had little option when he found out but to try, sentence and execute him. With the break-up of Alexander's empire and no strong and obvious heir his generals, known as the diadochi ('followers'), pursued their independent interests. Ptolemy moved to Egypt, answerable in name only to the Council of State that had been set up in Babylon after Alexander's death, and to Perdiccas, the regent who held Alexander's signet ring. At Babylon, Alexander's body had been prepared for the long journey back to Vergina, the royal burial ground in Macedonia, where Philip II's tomb has been found in recent years. On the journey, at Damascus, Ptolemy made his most astute move: he kidnapped the body on the pretext that Alexander had wanted to be buried in the shrine of Ammon at Siwa. The body was taken first to Memphis - where, nine years earlier, Alexander had been crowned pharaoh - pending the completion of the Siwa tomb. In the event the tomb was built at Alexandria. According to Strabo it was located in the area of the royal palaces known as the 'Sema'. Although Octavian/Augustus visited the tomb, it has never been found and the site is now probably under the sea, the coastline having shifted since then. With Alexander's body under his control, Ptolemy had an immense political and religious advantage, and Perdiccas realized this. In the spring of 321 BC he marched against Ptolemy with an army of 5000 cavalry and 20,000 infantry, but was repulsed near Memphis and then murdered by his own officers. The diadochi continued to war amongst themselves, although Antigonus Gonatus, Commander-in-Chief of the Grand Army, endeavoured to keep them under control by a firm policy of repression, replacement and execution where necessary. To ward him off three of the diadochi, Ptolemy, Lysimachus and Cassander, entered into an uneasy alliance that was to pay handsome dividends. When Antigonus prepared to attack Cassander in Macedon, Ptolemy marched against Antigonus' son Demetrius Poliorcetes and defeated him at Gaza in 312. A peace treaty the following year confirmed Ptolemy as satrap in Egypt. Wars amongst the diadochi continued. Ptolemy lost the sea battle of Salamis in Cyprus against Demetrius in 306 BC but held Antigonus back on land the same year at Gaza. At the battle of Ipsus in 301 Antigonus was killed and the three allies divided the spoils of empire between them. Ptolemy added Palestine and lower Syria to his Egyptian empire and under his rule they prospered. Ptolemy had secured his link back to the pharaonic line by marrying a daughter of Nectanebo II, but she had been set aside in 320 for Eurydice, daughter of Antipater, Regent of Macedon. By her Ptolemy had four children, and then another three by Berenice, a widowed lady- in-waiting to Eurydice, who had already borne three children (one of whom, Magus, was later to become king of Cyrenaica).